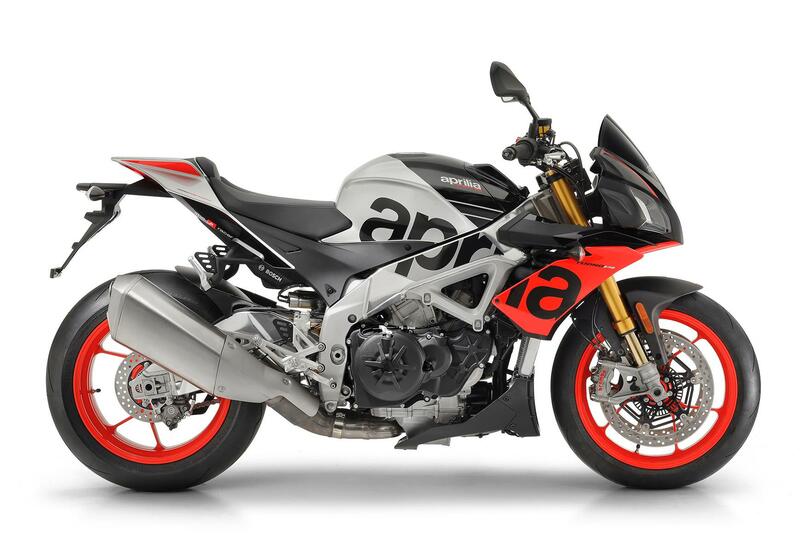 The Aprilia Tuono V4 is the pinnacle of super-naked factory street fighters – and yet the firm sells mere handfuls of them in the UK each year. That’s a genuine shame, because everyone should have the chance to feel the sublime insanity of that V4 engine, and reel at the control meted out by its overwhelming suite of electronic rider aids. There are plenty of super-nakeds with more character or panache, but none with more devastating performance. And for 2019, the list of brain befuddling electronics gets a little longer as the top-spec Aprilia Tuono V4 1100 Factory model gains Öhlins’ impressive Smart EC 2.0 electronic semi-active suspension system, adding yet another dimension of control to this road and track weapon. There are two main modes: semi-active, where the bike will sort everything out for you – and manual, which allows you to pick your own settings and disable any electronic meddling. Switching between the two settings is done via a simple button on the switchgear, with data constantly being supplied to the bike's dedicated ECU to ensure either mode works effectively. The semi-active mode constantly evaluates the feedback from the front and rear suspension, and the rider’s inputs to throttle and brakes, and delivers an ever-changing combination of micro responses aimed at making the rider feel like the suspension is doing nothing other than offer perfect support in all scenarios. The manual mode comes with three pre-set parameters to choose from, and disables the semi-active intervention. The Track, Sport and Road setting each alter the suspension to better match the performance characteristics expected in those riding environments – but you can obviously select ‘Track’ while road-riding if you’re feeling frisky, or Sport mode on track if it’s a bumpy, and you want a smoother ride. There’s also an OBTi (Objective Based Tuning Interface) available via the 4.3 inch colour TFT dash which enables the rider to effect further personalization to the settings, but unless you’re better than an Öhlins tech or Aprilia test rider, we’d probably leave it well alone. The rest of the Factory’s bewildering array of APRC electronic rider aids contains everything from bi-directional quickshifter to cornering ABS, eight-stage traction control, anti-lift, launch control, pit lane limiter, cruise control and more. There are two new paintjobs, too – but you’d have to be quite the aficionado to spot the subtle changes without having both versions in front of you. We're expecting a price around £16,999.